artist submitted by:International Stage Productions, Inc. Recognized worldwide as a leader of the movement to popularize jeel (music of the younger generation), Hakim is an innovator who has revolutionized the genre of sha’bi (indigenous Egyptian music). His music adds modern rhythms to a foundation of traditional sha’bi melodies, resulting in entirely new sounds. It is the music of the masses, evident by his ever-growing fan base throughout Europe, Australia, and the Middle East. Lauded as a musical “trail blazer,” Hakim has sold an estimated six and a half million units throughout his career. Just as sha’bi is defined as the music of the people, Hakim is someone his audience can relate to, through songs that fuse traditional melodies with urban dance beats, and lyrics that chronicle daily life through the rhythm of street slang. A major figure in the international music scene, Hakim has played to sell-out crowds in Europe, the Middle East, Australia, North America, and Africa. These concerts include major international festivals like the Sfinks Festival (Belgium), Les Orientales (St. Florent, France), Ghazala Beach (Sharm El Sheikh, Egypt), Palais Des Congres (Paris), the Taj Mahal in Atlantic City, and Extra Fiesta (Rome). He has received numerous accolades including the award for Best North African Singer 2000 at Africa’s prestigious Kora Awards, and he was chosen to represent Egypt at 1994’s Festival des Allumees in Nantes, France. In 1999, his rising popularity prompted France’s Blue Silver label to release “The Best of the Big Egyptian Star,” an album of hits that was met with acclaim from crowds of new European fans. Under academic pressure from his father, who, as the mayor of Maghagha, wanted his son to secure a professional future rather than follow his artistic proclivities, Hakim moved to Cairo to attend the prestigious University of El Azhar. Meanwhile he was meeting with other musicians at the cafes on Mohammed Ali Street (a centuries-old gathering spot for artists of all sorts) and his interest in renewing the sha’bi genre was cemented. It was there on the bustling streets of Cairo that he received his musical training for the music of the streets. One of Hakim’s teachers was the famed street accordionist Ibrahim El Fayoumi, who helped him convey in his music the unadulterated spirit of the street. With 1998’s Hakim Remix, he turned eight of his previously-released hits over to Britain’s Transglobal Underground, who then put their own spin on things. It was a daring move, as Hakim had to maintain the right balance between tradition and innovation. “I don’t mind pushing towards the evolution but I do not want to lose the identity in the process,” he noted. Also released in 1998 was the album Hayel, a selection of traditional sha’bi and return to his musical roots. Hakim’s experimental search for the perfect fusion of tradition with innovation is presented in his album Yaho, which released on Mondo Melodia / Ark 21 Records in 2000. The original version was already a huge success in the Middle East, having sold over 1 million copies. The U.S. version features four remixes by the acclaimed British group Transglobal Underground and two brand new songs including Yemin We Shemal by French producer Sodi and El Bi Hebeni El. It is a testament to Hakim’s sha’bi roots as well as a musical journey on an international level. In traditional sha’bi style, classical Middle Eastern instruments such as the oud and nay mingle with Hakim’s rich tenor vocals during the mawwal (the emotional melodic beginning to a song that is sung or spoken over a slow instrumental section before breaking into the fast-moving main body of the composition). Also keeping with sha’bi custom, Hakim’s lyrics, which are mostly about everyday life, are never maudlin or heavy; rather they are coy, light-hearted, and witty. His most significant live album was recorded in the heart of Brooklyn New York, released in 2001 The Lion Roars, Live in America produced by Dawn Elder, and released in on Mondo Melodia/Ark 21. This album was a revelation for Hakim in capturing the true essence of his live musical performance and sound. This album in its purity captures the fiery energy of this innovative performer’s music, the solid and infectious percussion rhythms of his band and the emotion and power of his vocals. Singing to audiences who mostly didn’t understand a word of Arabic, he captivated them with his voice, and the rootsiness of his sha’bi (Egyptian street pop) music. And when he improvised on the opening mawals (introductions) the power of his voice and style became unmistakable. This release was also followed by the most significant tour in Hakim’s International career. Originally slated to commence his first major American tour in September of 2001 along with fellow Algerian Artist Khaled, Hakim was stunned as the entire world watched on TV the devestation of the 911 events in America. He stood at the airport watching the news with his Egyptian orchestra all set to board a plane to NY on the eve of 911. The tour was of course canceled, but notably rescheduled a few months later. Hakim along with his entire Egyptian Orchestra believed it was vital to the healing of communities of all ethnic backgrounds in the United States to proceed with his tour North America. Hakim wanted to bring another face, and share the heart and love the Egyptian people felt and sympathy they wanted to express to all Americans for this tragedy. And show that the general populations of Egypt are just ordinary folks just like the people and communities here in all across America. This was a historic tour, and was welcomed from city to city. Hakim was hailed by audiences and International and National media for his diplomatic efforts, and his use of music to bring people together. In 2004 and 2005 Hakim released two more albums Talakik & Kolo Yorkoss. Talakik, released on Ark21 featured two hit singles and won several Latin music awards. The first Ajielbi (A duet with Olga Tanon, featuring Delinquent Habits which topped the Latin & Arab Music charts, followed by a second hit “ Salam” featured in the movie staring Reece Witherspoon Vanity Fair. Lela featured collaborations with the legendary James Brown and Stevie Wonder. His song El Salam Aleikum is used in the sound track ot the film Vanity Fair featuring Reese Witherspoon. With several current hit singles in the Middle East and the pending World wide release of the remix album with Don Omar, Hakim is poised to bring sha’bi to new musical heights and new audiences. He is currently working on his next album which is sure to take the mover and shaker to hole new realm sure to delight both fans and critics alike. Stay tuned and hang tight, Hakim is about to roar once more. During the next few months, Hakim will bring his dynamic stage performance to North America, Germany, France, and Australia. Hakim’s contagious melodies along with his lyrics of the street make his music popular to mass audiences. His dance, sing-along, and feel-good music are the signature of Hakim’s success. In December 2006 HAKIM performed in Oslo (N) at the Nobel Peace Prize Concert. Also in 2006 HAKIM performed in Switzerland, Germany and the United States. 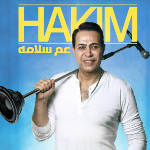 In 2007 HAKIM released a new CD “TIGI TIGI” which immediately made it into the charts in Egypt and around the Middle East – not to mention also in France (Beur FM October ’07). He has toured with his new show for the album in extensively in 2008-2009 in; Australia, Europe – (Austria, France, Germany, and Switzerland) and the Middle East. 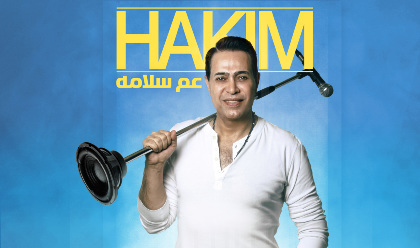 In 2011 HAKIM released a new album “YA Mazago” which included the highly acclaimed song “Kolena Wahed” which called for a unity of the peoples of the Arab world. He has been touring the extensively through 2011 and 2012 promoting the new album. In 2013 HAKIM released a new single “Resala”, a song promoting peace, that has touched specially the young generation in Egypt and the Middle East. In 2014 HAKIM is invited to write the lead song and perform it live in a movie Halawet Rooh, of the same name, staring the Middle East’s most popular actress Haifa Webhe. The movie was a success and the video clip released of the song during the summer reached 39+ million views: https://youtu.be/Hd4zxdwr_X0. HAKIM toured extensively in the Middle East to promote his single and also performed a limited number of shows in Europe. One of his favorites was a concert offered by the city of Malmo (SE) to the new community of refugees from the Middle East – more than 10,000 people attended. On October 5th, 2015 HAKIM released his newest single “Aam Salama” which has been very well received. On youtube.com it surpassed a million views in just 3 days. A second single “Aala Wadaak” will be released in December. Also, in December 2015 HAKIM will host a new TV show ‘Negm El Shaab” based on a talent contest to promote the new generation of Egyptian Shaa’bi singers.